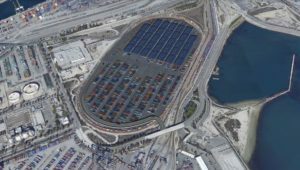 The Harbor Performance Enhancement Center (HPEC), a project proposed by the Port of Los Angeles on Terminal Island to minimize port congestion and increase cargo flow, has secured USD 130 mln in funding from Macquarie Principal Finance, a division of Macquarie Group, informs American Shipper. The HPEC is designed as a common container storage yard serving all the 13 container terminals of the port complex of Los Angeles and Long Beach. The site of the former Los Angeles Coal Terminal with the area of 110 acres (44.5 hectares) would accommodate up to 3,500 containers on chassis per day at full development, which is expected in 2-3 years. Currently, HPEC plans to open a pilot version of the terminal within 6 months with slots for 400 containers. Explaining the project, HPEC CEO Jonathan Rosenthal said that it would not simply be a parking lot, but a service. Containers arriving at the ports would be loaded on chassis and then moved to the storage yard by drayage trucks that HPEC will hire. HPEC will act as a hub and spoke distribution centre, allowing the customers to pick up or deliver their cargo from/to the HPEC storage yard, rather than visiting the particular terminals where they often encounter long delays. The facility will have a computer system that would allow cargo owners know what containers are available, and where they are. HPEC will be equipped with automated gates and truckers will be able to enter it 24 hours a day, 7 days a week. The turn times are expected to be 20 minutes. He has not mentioned who will pay for this service, nor how much will be charged. The project also includes an educational component, as HPEC would also serve as home to the institute for logistics research, which is announced to become the largest freight laboratory in the world. The project is undergoing the required California Environmental Quality Act review and permitting process and is expected to be launched by early summer.